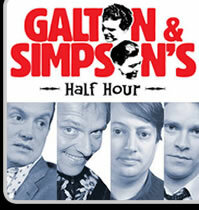 Celebrating 60 Years of Galton and Simpson. 4 New versions of classic Ray and Alan scripts. RAY GALTON was born in Paddington in 1930. ALAN SIMPSON was born in Brixton in 1929. They first met at Milford Sanatorium in 1948 where they were both undergoing treatment for T.B. Previously, Alan had been working as a shipping clerk, and Ray had been employed at the Transport and General Workers' Union. At the hospital the patients had an amateur radio room as occupational therapy, and Ray and Alan decided to write some comedy shows together. They had both been interested in comedy and avidly listened to such radio hits as "TAKE IT FROM HERE" "THE GOON SHOWS" and "THE BRADEN SHOWS". They wrote four radio scripts entitled "Have You Ever Wondered" at the sanatorium as publicised in the Milford Bulletin 1949, and then 'dried up'...but not for long. After leaving the hospital, Alan was asked by a church concert party, of which he was a member, if he could write them a show. He contacted Ray, and by 1951 they were writing professionally for the BBC. By 1952 the GALTON AND SIMPSON partnership was in full swing and at about that time, they met Tony Hancock. In the early stages of their career, they worked from an office over a greengrocer's in Shepherds Bush, along with a crowd of up and coming writers and performers including Peter Sellers, Frankie Howerd, Spike Milligan and Eric Sykes. In 1954, Ray and Alan started writing "HANCOCK'S HALF HOUR", 6 series of which ran on radio until 1959 and consisted of 101 episodes. When it transferred to television in 1956, 63 episodes were screened before the 7th series finished in 1961. Since then the HANCOCK scripts have been translated and produced very successfully in Scandinavia as "FLEKSNES" and with Georg Thomalla starring in a German version. "PFEIFER" a German re-make will be screened in 2000. During the ten years from 1951 to 1961, Ray and Alan established themselves as one of Britain's most successful comedy writing partnerships ever, writing for nearly all the top comics of that era. At the end of 1961, they started off the BBC Comedy Playhouse, writing two series, 16 episodes in all, out of which emerged "STEPTOE AND SON". Eight TV series of "STEPTOE" ensued over the following 12 years and five "STEPTOE" radio series. Also, based on "STEPTOE", there have been hit TV versions around the world including America for 5 years as Number One in the ratings with the black version "SANFORD AND SON", in Scandinavia as "ALBERT OCH HERBERT" on television, stage and cinema, in Holland as Award Winning "STIEFBEEN EN ZOON" and in Portugal in 1995/6 as Award Winning "CAMILO & FILHO" for 26 episodes. It is also under option currently in Australasia and the Far East. Among Ray and Alan's other British TV credits are series for FRANKIE HOWERD, SID JAMES, LESLIE PHILLIPS and LES DAWSON, and a nine-part adaptation of Gabriel Chevalier's "CLOCHMERLE". Ray and Alan's stage credits include a successful revue "WAY OUT IN PICCADILLY" on which they collaborated with Eric Sykes, and which starred Frankie Howerd and Cilla Black. Their adaptation of Rene d'Obaldia's "THE WIND IN THE SASSAFRAS TREES" also starred Frankie Howerd and transferred from the U.K. to Broadway, U.S.A.